Tata Sky Dth added 10 new HD channels on its HD direct to home TV service. Direct to Home TV (DTH) operator Tata Sky is adding 10 television channels of high-definition (HD) on its platform. The new HD channels added on Tata Sky DTH are Romedy now HD, Baby TV HD, Da Vinci HD, NGC People HD, Travel XP HD, Mazhavil Manorama HD, MTV Indies HD, VH1 HD, Nat Geo Music HD and Naaptol HD. Currently, the TataSky DTH operator offers 50 HD channels and HD services in all genres in its Tata Sky HD TV package. The new additions increased HD TV channels of Tata Sky HD to 60. The DTH operator has recently added about 49 SD channels at once to enrich their number of channels. Thus, TataSky DTH has more television channels to offer and thus becoming a top direct to home TV brand in India. Last year Tata Sky Dth service shifted to MPEG-4 technology from MPEG-2 DVB technology to provide more channels. The transition to MPEG-4 format was necessary because of the long delay in additional of the transponder capacity from the commercial arm of ISRO Antrix, which is the coordinating body for the purchase of the transponder capacity. DTH operators expected more capacity through GSAT-10 satellite which has 12 Ku-band transponders,12 C-band, and 6 low c-band transponders. 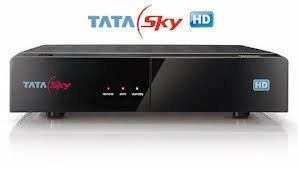 A high official of Tata Sky told www.sattvdishdth.net and told that the DTH operators will receive GSAT 10 transponder space and KU band satellite signals to offer more HD channels, 4K, and interactive service. "Tata Sky Dth wants to use the new satellite GSAT 10 space to offer more HD channels, 4K, interactive services and visualizing services such as subtitling, which is not available at this time," a source told sattvdishdth.net.